Mount Snow Resort announced today that it plans to open for the 2012/2013 winter ski and snowboard season on Thanksgiving Day, Thursday, November 22, with five trails covering about 30 acres of skiable terrain serviced by three chairlifts. The southern Vermont resort has been making snow every night for the past week, taking advantage of even the shortest windows of snowmaking temperatures in an effort to get the season off to a good start. 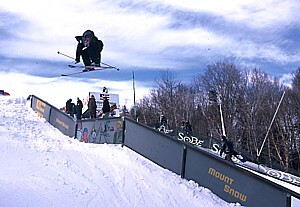 During a time of year when many ski areas only offer open terrain at higher elevations where snowmaking conditions are better and skiers and riders must download on chairlifts to the base of the mountain, Mount Snow has been experiencing a string of temperature inversions during which the air is much colder at lower elevations than it is at the summit. Because of this weather anomaly and the high snowmaking production at lower elevations that results from it, the resort will start the season by operating two of its high speed quad chairlifts that reach roughly three-quarters of the way up the mountain but no summit access. Mount Snow plans to operate chairlifts from 8:00 a.m. through 4:00 p.m., Thursday through Sunday. If snow conditions permit, the resort will move to normal midweek hours of 9:00 a.m. to 4:00 p.m. starting on Monday. Lift tickets for opening day will be $49 for adults (age 19-64), $39 for youth and seniors (age 6-18, 65+), $30 learning terrain-only (Discovery Shuttle Triple) and kids age five and under ski and ride for free. Events for opening weekend include a Turkey Hangover Hill Climb on Friday, Torchlight Parade and Fireworks display on Saturday and grand opening celebrations for The Cupola retail shop as well as the Snow Barn nightclub. For more information on opening weekend, snow conditions and deals visit http://www.mountsnow.com.